1. In which year will Microsoft implement TPM as a certification requirement for all Windows devices, including Windows phones? 2. True or False: With Windows 8.1 devices, pre-boot authentication is always required to ensure the integrity of the system. 3. Which of the following helps to reduce hardware costs associated with encryption? 4. True or False: For a Windows 8.1 user, the Bitlocker Recovery Key is always automatically escrowed. 5. Which of the following relies on application tagging? 1. When is encryption first implemented on a new Windows 8.1 device? 2. True or False: With Windows 8.1 certified “Instant Go” devices, memory is soldered to the chip on the motherboard. 4.Which of the following is used by Windows 8.1 Bitlocker to provide improved system integrity for secure boot scenarios? 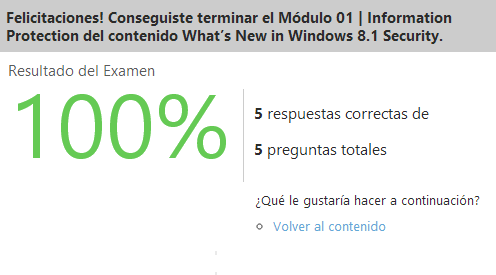 Publicado por El Guille en 6/08/2014 12:28:00 a. m.
--How does Windows 8.1 protect system memory from attack? --What type of attack relies on accessing the memory of a system? --Which of the following helps to reduce hardware costs associated with encryption? True or False: When a Bitlocker-protected Windows 8.1 device is accidentally locked, all data will be automatically wiped. Which of the following facilitates reboots of TPM-based systems in a data center? Genial, mucho valor de mi parte a tus aportes! !